I started to direct seriously with the founding of Kompani Komedi. The performances I directed with Kompani Komedi led also to other commissions. As I became artistic director for the Theatrestudio my engagement started to focus there. 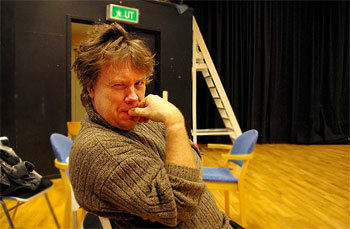 That does not prevent me from directing other plays, with other companies outside the Theatrestudio. EVIGA BERG Teater Sláva Huddinge & Sweden tour. ALLTSÅ DÖR JAG The Theatrestudio Kulturama, Stockholm. RAGGA DAGGA DANG The Theatrestudio Geten, Stockholm. MILLENIEPROJEKTET Kompani Komedi The Old Town of Stockholm. SLAUGHTERING The Theatrestudio Geten, Stockholm.